The overall message from this normalised EBIT for food service and consumer products is that it is almost certainly insufficient to allow for a fair share of un-allocated company costs of $493 million plus net finance costs of 416 million, and still provide a significant net contribution depreciation and any return on capital. Accordingly, even on this normalised basis, it is evident that it is commodities and some other ingredients that are propping up the overall business. Fonterra’s China farms have made a stated loss this year of $9 million EBIT. However, this is not the real loss. First it is necessary to add in another $30 million that the ingredients business lost by buying the milk well above market prices and then selling it at a loss. This brings it up to $39 million loss before any depreciation and interest are charged. Production has also declined this year, apparently linked to effluent management issues. Shareholders will recall that Theo Spierings' $8 million payout in 2017 was because of the big cost savings he had made over the previous two years, which led to him getting big bonuses. Well, as can so often be the case with cost-cutting, short term gains lead to longer term losses. Updates: This article has been updated in the two paragraphs marked above. enough is enough, its time the farmers made the board and ceo aware of who owns them. The company is refusing to give details of the meeting at tourist and surf mecca Huntington Beach, which NBR has reported was attended by up to 200 staff from the co-op's New Zealand milk product division at the time Fonterra was announcing a historic annual loss of $196 million last week. pop along to the accounts meeting sharetrader and ask your question - you still have a financial interest in a dairy farm? I acknowledge Open Country's payment system is much better for cashflow and I understand about to get even better. So you are going to switch your other farm over too - or is that not an option because of processor options. Otherwise why would you not switch it over too, given OCD is better returns? That's gotta be a big albatross around the neck, and, worse, it's not Milkable.. The interest is one thing. But more constraining is total liabilities of $11.7 billion dragging against gross assets of $18 billion. The banks can see that there is not a lot of headroom, recognising that $3.2 billion of assets are intangibles for supposed brand values and goodwill. 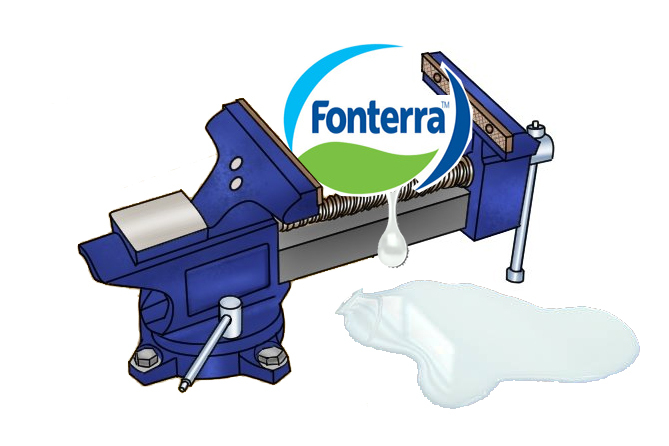 Fonterra calculates its gearing on the basis of interest-bearing debt divided by interest-bearing debt plus equity. This disguises for the gullible that total liabilities are close to double the equity which in itself is heavily dependent on intangibles. Those intangibles are highly dependent on perceived capital value of normalised profits. Thanks Keith that was excellent. I had no idea what a Zombie Fonterra had become. It looks to me like they have a genuine need for continued low interest rates and a falling NZ dollar to turn this around.. What year do you think they may start paying dividends again? One of the challenges that Fonterra has is that the non-farmer owners of the investment units (the so-called Fonterra Shareholders Fund) have purchased these units for the dividends rather than the capital growth. So a 'retain earnings' policy would need growth-focused shareholders to come on board as 'earnings-focused' investors bailed out. Incidentally, the Fonterra dividends are tax deductable to Fonterra (under co-operative law), and therefore tax assessable in the hands of the unit holders. So essentially sour milk that you pray will transform into yoghurt over time. Great comment Keith - Fonterra investment unit holders want dividends, but are happy to invest in Synlait and A2 - which many commentators on here seem to think Fonterra should aspire to be like, yet in the latter two they have never received a dividend and appear happy not to do so. To be fair CO local investors were never happy with Synlait. Thats why Bright own most of it, with locals shunning the original share offer and only in the last 12 months pushing the price up, maybe realizing the profits accumulated over a number of years were real, unlike Fonterras. "They were driving towards the wall for a long time." Sorry, Kate, completely different business configurations. Mainzeal was a single-country construction firm: - a series of capital projects. So there is little R&M, little research, and the sales function consists of schmoozing likely developers, hotel chains, large companies and the like. Profitability consists of ensuring that the quotes plus variations don't exceed costs. Cash flow is a perpetual terror for such firms, because the 'carry' needed to pay staff and suppliers between agreed contractual instalment settlements on contracts, can be substantial. One delayed or disputed payment, one supplier price hike, one strike, one bad hair day at Council Inspection times - it's a long list - can send 'em off the cliff. Fonterra is a processing operation. Raw milk in, lotsa technical processing, lotsa research and product development, lotsa QC, lotsa plants across several countries, selling to a multiplicity of buyers, in a heavily competed international space. Way more complex than a buncha building sites.....but a lot of momentum/inertia to carry 'em through the Bad Times. That inertia has, it seems of late, turned from an asset to a liability. But that too can be turned around. No fire sale imminent here. Plus it's a co-operative. 12K plus farmers as suppliers. They will be having something to say about all of this over the next while, including choices of Directors. Whereas a construction company that goes belly-up - let's just say there are Bargains to be had at the liquidation sales....within weeks. I disagree with u Waymad..
Business principles are ubiquitous .... Incompetence is incompetence. Prudence and good governance applies to all..
Fonterra is a Farmers Co-operative.. The intent of any "farmers co-operative " is to maximise profits for farmers by owning as much of the supply/value chain as possible..
Why is Fonterra buying farms and cows and shares in crappy companies in China..?? Why does Fonterra have such a debt riddled Balance sheet...??? Kate posted this link a few weeks a go..
Scroll down where it describes the plight of small farmer producers and how the way to better profits for them was to form co-operatives and own as much of the value chain as possible... ( about maximising the returns on what they produce....and not at all about creating some kind of Multi national monster who has lost its way ). My note was a 'glass half full' (of milk, what else?) sorta comment. The point was that it's completely ridiculous to try to compare a contractor with a processor. Totally different configurations, different challenges, and a different management challenge space. A contractor needs to quote sensibly, watch cash flow like a hawk, be vigilant about variations, control costs and subbies, and harvest likely new builds into the sales pipeline for evaluation. There's literally no fixed plant that cannot be hired in or subbed out, there's no R&D in any scientific sense, there's little R&M. The companies are often tightly held, so wider shareholder interaction is sparse and superficial, and reporting likewise. Mistakes (think Fletchers in Christchurch) are often only found and publicised months and years after contracts conclude. A processor has many, complex, fixed plants that need to run to a high capacity factor, a huge internal workforce that has to be motivated, managed, and paid well given their use of capital equipment worth millions, and all this to technical standards that in many cases are assessed several times per day. The sales function is dealing with multiple countries, currencies, cultures, and legislation/standards. The supplier/shareholder relationship is close, intense, and inescapable. Mistakes are detected quickly, get into the public eye fast (think the SanLu scandal) and can affect many parts of the business from collection, through processing, to logistics and delivery. Management principles are certainly universal. But management styles, teams, cultures, challenges, response profiles and capabilities are most certainly not. So the hints in the thread about 'interchangeability' - meaning that a transplant of some sort could, like a Rugger coaching team from another franchise, Work Wonders - are, if I am reading them aright, so far off the mark as to be hilarious. Fonterra needs to get its act together . This entity is to NZ what BHP is to Australia or Boeing is to America , its our bellwether. They need to engage with us, become true Corporate citizens and share with the NZ public and outline the turnaround and debt reduction plans and direction for the business . It needs to be more open . Its secrecy and holier-than -though attitude does nothing to get the support it deserves as our bellwether company . I wouldn't hold my breath for that to happen. Dairy farmers (and NZers in general) were sold on the fraud that "bigger is better" and "economies of scale" will drive "efficiencies and greater returns" and all that drivel. However, the reality is that these monopoly seeking entities all end up imploding under their own inward-looking bureaucratic structures and incompetence. Outside of Fonterra, we have Fletchers, Mainzeal, Solid Energy and a few others that are in the wings and waiting to tip over once interest rates start rising again eventually. Add to that Auckland Council. Isn't The Warehouse NZ's real bellweather? I hope they took their surf-boards ! How they hell are they going to explain this one ? Any media spin or damage control will never cut it . We'll get spun a line, and swallow it hook, line and sinker. I want to start a new Multi-Billion Milk Marketing Board to replace Fonterror. Can someone please loan me a Trillion Dollars to start with. We could meet at your expense on the Tourist Island I just bought. Raw figures I know, but Synlait just announced a profit of around $1 per kg ms while paying even more than Fonterra for the raw ingredient. This is not the first year they've achieved that and its notable and been pointed out on this forum that this has allowed them and the other smaller players to increase capacity and product range using profits to do so. Elsewhere Ive seen someone saying Fonterra should be paying less in the milk price to prop up profits, I would imagine the smaller companies CEOs with really wide smiles at that thought. The key thing that changed everything for Synlait was their decision to get into A2. So far, none of their other value-add strategies has been a winner and some have quietly failed. When they decided to dip their toe into the water with A2, with consideration beginning in January 2011, then it was only one of six consumer-focused initiatives. Indeed they took on the A2 initiative with considerable scepticism. So my point here is that mindless 'value-add' is not a pathway to wealth. There has to be something that in the minds of consumers is a genuine differentiation and provides competitive advantage. Essentially, Fonterra got it wrong with its value-add decisions. Fonterra's milk price was $6.69 - excluding incentives. True, but that only emphasizes the fact that Fonterra doesn't offer anything similar . i understand Synlaits incentives are set to double. They may need to double them - I hear they only have around half of the suppliers they need next year for their Pokeno plant. It would be interesting what Fonterra's incentives add up to, because they do offer incentives - but not all suppliers can access all of them - that can be the issue with incentives. Then again, if the chatter is correct, and Saputo or Land o Lakes are successful in bidding for Westland that could open up a whole new ball game with them as the 'new kids on the block'. They both have some serious $ power behind them - and whose to say they would stop at Westland? Why doesn’t Fonterra spread the risk and diversity into other food products rather than having everything milk based? It’s worked well for Nestlé. But Nestle is a food company funded by investors. Fonterra is a dairy co-operative, approximately 90 percent of its shares owned by farmers who have made their off-farm investments (i.e. Fonterra) specifically to de-risk their on-farm investments. Their key requirement is that the tanker will come up the drive each day and they will get paid the raw milk value of their raw milk. Delboy, the plants are huge, complex, fixed and expensive. They cannot just be switched into 'other products' - they are essentially tuned and optimised for milk only. Changing the product mix through them requires physical re-configuration at massive cost, both in terms of pure capex, and of opportunity cost while the thing is outta production. To suggest the plants could process something else - say - honey - is like suggesting we could just run Chocolate through Marsden Point oil refinery and expect Hot Chocs outta the far end. Sure, F could use its technical, marketing, logistics and other capabilities to branch out into other strands of Ag-related business. But, and this is the kicker, when it comes to actual Processing, it would be new plants required. So as well as the pure Capex needed - billions - there's siting, regulatory (RMA, anyone? there'd be Snails....), technical compliance (ISO etc), staffing, training, and then, and only then, punch the Big Red Switch and set the thing running. Glass half full - might work. I worked in a Milk powder factory back in the early 1980s'... They are not as complex as you think. Back in 1982 we were (NZCDC ) making cocoa powder for Nestle, reduced milk for Nestle, and basic baby milk powder for ...I think, Nestle... but mostly just spitting out skim milk powders.. There is no reason why , over 40 yrs the Dairy industry could not have grown competitive brands..
Nestle has always been the example for me..
Keith thank you for your efforts to help us understand some of the less obvious detail in the Fonterra accounts. However I don't agree with the last sentence of your above reply. For as long as I have been aware (long before the formation of Fonterra) dairy farmers have aspired for returns better than just the raw milk price. That is why we diversified into making spreads and powders and formulas. We produced way more than could be consumed nationally so the milk had to be processed into something non perishable. Once that commitment was made we looked for the most profitable use on a sustainable basis. Fonterra efforts are nothing new, little co-ops like Northern Wairoa in Dargaville were making hi-tech high margin products 30 or so years ago. As you rightly state elsewhere it is Fonterra's less than stellar batting average at picking winners that is of real concern or conversely their skills at picking dogs that worries me.. Yes, the last sentence of my reply to Delboy was too much of a generalisation. I was trying to indicate that getting into non milk products was likely to be many bridges too far for most shareholders. However, I know that one of our co-ops has been tossing around some ideas that go well beyond bovine milk. I have elsewhere used the example of the Tillamook Co-op in Oregon as an example of a co-op that has been extremely successful with value-add products. But it needs some key competencies! I cannot make judgement on that. I have spent time at Tillamook, and I have also visited Three Mile Canyon. But that does not give me enough knowledge to have an opinion on the JV. A starting point as to what I would need to know is whether or not the whey plant is demineralised whey isolate. Currently, we have no ability to produce this in NZ. I would also need to know the financial aspects of the revenue sharing. correct they would have to invest in new plants but i would rather them do that and expand the product base with a view to new exports than waste money on running farms in china which in my opinion will never be profitable. Ever wondered what the supply agreements with clients are sharetrader? Fonterra has been paying too much for milk, the owners wanted future returns capitalised into the milk price. Welcome to the future guy's. NO THEY HAVE NOT PAID TOO MUCH FOR THEIR MILK. Their competitors are matching them on payout or there abouts and able to make a profit. Investment in new factories is being made by some very astute businesspeople, look at Pokeno on the basis of recent past raw milk prices. Fonterra is losing ground with how they are investing their farmer shareholders capital and the major losses of capital they are making with poor decisions that can be traced back to the board table. The shares in Fonterra have been overhyped with value based on excessive dividends and paper asset values. An example-valuations and P/E that compare Fonterra to Nestle and other global food companies. Apart from some small parts of the business what is the real transferable value of a bunch of stainless steel in the back blocks of NZ with no easily identifiable alternate use? the others can afford to pay more for milk, Fonterra cannot. Those shares were borrowed against by the farmer owners, the banks treaded them as good as gold. ... and then complained about the milk price - lol. Transferring generations of cooperative capital to a tradeable share, is anathema to the health, longevity and ultimate success of a cooperative. It has helped strengthen the balance sheet of a few farming shareholders at the time of DIRA inception, but is going to be the death knell of the industry. you are always good value Omnologo. Perhaps modern corporate farmers are not suitable members of a co-op? A company has limited liability while the family farmer really does have %100 of his skin in the game. In HB there used to be something like 650 family orchardists in the late 70's. Today 18 large growers control the industry and of those 2 control just under %50 of the market, I don't think that is a great outcome for anyone. Around here the same handful of farmers buy nearly every farm that comes on the market. Our Councils have proven to be very flexible when it comes to dealing with corporates, corporate power transfers smoothly to political power. The finance industry behind this growth has a lot to answer for. The family farmer was the backbone and we are going to rue the day that changed. I think you're right Andrew. I think NZ mimics U.S political policy, and capital gains are our subsidies, all of which is designed to promote corporate farming over one man family farms. My point Andrew is that they are not paying too much for the milk. They just don't seem to have the competencies required to make the right investment decisions. Decisions such as what is Fonterra and what will it be in 10/20 years? For me one memorable learning from reading Jack Welsh's book was the requirement for each subsidiary to define itself, it's purpose for being. Thereby defining it's market, customer base, who it's competitors were, what its advantages were, and then deciding to only commit their capital to where they had a genuine shot at being number 1 or 2 in that market place. Fonterra has chewed through so much equity lately their choices are now severely limited. Regarding farmers borrowing against their Fonterra shares - more fool them. Apart from excessive dividend stream why are they worth more than $1 each? When have the bank's acceptance of an asset value ever meant it is a good investment? As a note the bank's don't treat Fonterra shares as blue chip for loans like they once did. At one stage you could borrow up to 80% or 90% of "market value. It is easy to criticize from the outside but with the advent of the big corporate supplier/shareholders most small time cockies like me will forever be on the outside with little/no influence. The big issue that I can see is Fonterra are paying far too much for their milk, which is why they posted a loss. Please understand - Fonterra's losses are not from paying too much for milk but making too many mistakes and spending too much AFTER COLLECTION. Farmers don't get to hear half the horror stories that occur through the manufacturing and marketing process ( here I want to be careful of defamation ). Never mind the already public large scale screw ups. That is why the more efficient processors and marketers can take market share off Fonterra. That is why they are coming to NZ to build their factories. How can Open Country compete and be profitable. The Talleys are not into social justice, they are making a dollar. By being better. As a fellow supplier, I think you make good points Wilco. I agree that Fonterra don't pay too much for milk, and given recent increase awareness about the distinctive composition of pasture based milk, they don't pay enough. However it could be argued that the competitors can pay more for their milk, because of a more favourable collection catchment, due to the market distorting subsidies regulated through DIRA. I acknowledge that DIRA is regulation promoted by industry leaders such as Sir Henry et al. and current board members, and supported by the majority of Fonterra suppliers. Ah fair enough, I hear what you're saying and agree 100%. I'll also add that if Fonterra were paying a little less for their milk then they might be a bit more profitable. But we've got a candidate assessment panel ranking the 'best' directors for shareholders to vote for, and they offering competitive remuneration to attract managers to add value to our milk, so why revert to the age old chestnut of driving down input costs to 'create' so called value. Our Independent Selection Panel has selected a candidate that runs a charity that is under investigation by the Charities Commission. Hopefully the investigation will be concluded before voting is started - I didn't find any report that says the investigation is concluded but am happy to be corrected. Trinity Lands maybe cleared but if it's not...what's the reputational risk for Fonterra? Looks like our shareholder council doesn't see a problem either. Thanks Nzdan for your 100% agreement, If Fonterra was to pay less for the milk then yes short term their profit would increase but so would all their competitors who would get stronger and more aggressive and entry into the NZ milk market would look even better to new entrants to processing. So long term say 5-10 years from now Fonterra would be even weaker and with less market share and then we run the frightening scenario of having to operate all that huge stainless steel at less than profitable volumes, remembering these huge lumps of stainless steel were a key plank in their strategic direction to be a large scale, low cost manufacturer of WMP. A product that may now have a limited future financially. Regarding catchment areas I agree Omnologo however the couple cents advantage should be compensated by the comparative efficiency of the larger Fonterra factories. Or that is what they told us as they shut down the smaller provincial sites and drove our milk hundreds of kms to fancy big new ones. Scary - either they do know more specifics and aren't saying - or they don't know. Neither scenario is at all comforting. ( Chasing short term profits at the cost of long term relationships and strategies )....duh..